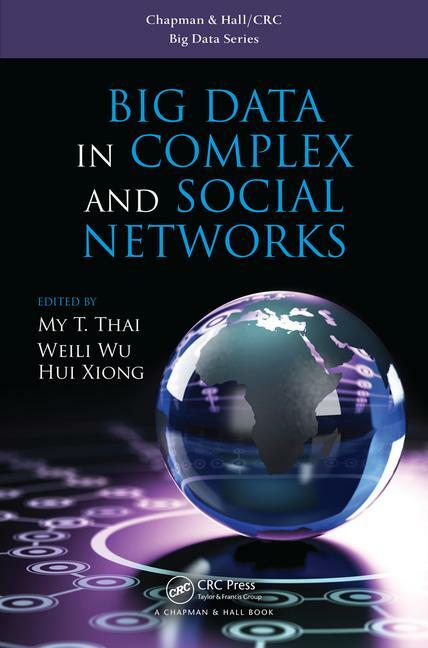 My T. Thai, Weili Wu and Hui Xiong, Big Data in Complex and Social Networks (Chapman & Hall/CRC Big Data Series) . ISBN-10: 1498726844, ISBN-13: 978-1498726849, November, 2016. Shashi Shekhar, Hui Xiong (Editor-in-Chiefs), Encyclopedia of GIS (The book web site maintained by Springer). (Brochure). ISBN-10: 0387359753, ISBN-13: 978-0387359755, Springer; 1 edition, January, 2008. CHOICE Outstanding Academic Title of the Year 2008. 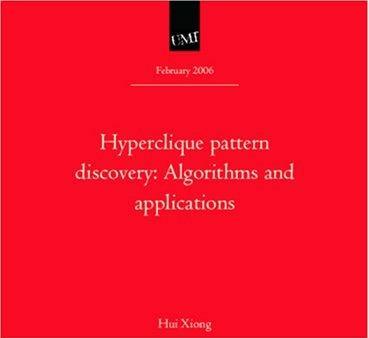 Hui Xiong, Hyperclique pattern discovery: Algorithms and applications, ISBN: 0-542-26663-6, ProQuest Information and Learning, 2006. Weili Wu, Hui Xiong, Shashi Shekhar (Eds. 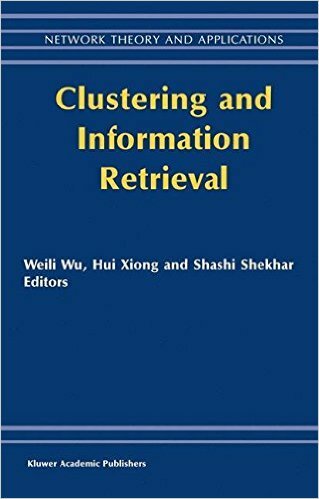 ), Clustering and Information Retrieval , ISBN: 1-4020-7682-7, Kluwer Academic Publishers, 2003. Tong Xu, Hengshu Zhu, Hao Zhong, Guannan Liu, Hui Xiong, Enhong Chen. Exploiting the Dynamic Mutual Influence for Predicting Social Event Participation, IEEE Transactions on Knowledge and Data Engineering (TKDE), 2018. Zhao Zhang, Fuzhen Zhuang, Xuebing Li, Zhengyu Niu, Jia He, Qing He, Hui Xiong. Knowledge Triple Mining via Multi-Task Learning, Information Systems, 2018. Haochao Ying, Jian Wu, Guandong Xu, Yanchi Liu, Tingting Liang, Xiao Zhang, Hui Xiong. Time-aware metric embedding with asymmetric projection for successive POI recommendation, World Wide Web (WWWJ), 2018. Jie Liu, Bin Liu, Yanchi Liu, Lina Feng, Huipeng Chen, Hui Xiong, Yalou Huang. Personalized Air Travel Prediction: A Multi-factor Perspective, ACM Transaction on Intelligent Systems and Technology (TIST), 2018. Chen Zhu, Hengshu Zhu, Hui Xiong, Chao Ma, Fang Xie, Pengliang Ding, Pan Li. Person-Job Fit: Adapting the Right Talent for the Right Job with Joint Representation Learning, ACM Transactions on Management Information Systems (TMIS), 2018. Bowen Du, Wenjun Zhou, Chuanren Liu, Yifeng Cui, and Hui Xiong. Transit pattern detection using tensor factorization, INFORMS Journal on Computing (JOC), 2018. Wenjun Zhou, Hui Xiong, Lian Duan, Keli Xiao, and Robert Mee. Paradoxical correlation pattern mining, IEEE Transactions on Knowledge and Data Engineering (TKDE), 2018. Yanchi Liu, Chuanren Liu, Nicholas Jing Yuan, Lian Duan, Yanjie Fu, Hui Xiong, Songhua Xu, Junjie Wu. Intelligent Bus Routing with Heterogeneous Human Mobility Patterns, Knowledge and Information Systems (KAIS), 2017. Jingyuan Yang, Chuanren Liu, Mingfei Teng, Ji Chen, Hui Xiong. A Unified View of Social and Temporal Modeling for B2B Marketing Campaign Recommendation, IEEE Transactions on Knowledge and Data Engineering (TKDE), 2017. Keli Xiao, Qi Liu, Chuanren Liu, and Hui Xiong. Price Shock Detection With an Influence-Based Model of Social Attention, ACM Transactions on Management Information Systems (TMIS), 9(1): NO. 2 (2017). Leilei Sun, Chonghui Guo, Chuanren Liu and Hui Xiong. Fast affinity propagation clustering based on incomplete similarity matrix, Knowledge and Information Systems, 51(3): 941-963 (2017). Yanjie Fu, Guannan Liu, Spiros Papadimitriou, Hui Xiong, Xiaolin Li, Guoqing Chen. Fused latent models for assessing product return propensity in online commerce, Decision Support Systems, 91: 77-88 (2016). Chuanren Liu, Hui Xiong, Spiros Papadimitriou, Yong Ge, Keli Xiao. A Proactive Workflow Model for Healthcare Operation and Management, IEEE Transactions on Knowledge and Data Engineering (TKDE), 29(3): 586-598 (2016). Hao Zhong, Chuanren Liu, Junwei Zhong and Hui Xiong. Which Startup to Invest in: A Personalized Portfolio Strategy, Annals of Operations Research (ANOR), pp 1-22 (2016). Bin Liu, Yao Wu, Neil Zhengqianag Gong, Junjie Wu, Hui Xiong, Martin Ester. Structural Analysis of User Choices for Mobile App Recommendation, ACM Transactions on Knowledge Discovery from Data (TKDD), 11(2): NO. 17 (2016). Yanjie Fu, Hui Xiong, Yong Ge, Yu Zheng, Zijun Yao, Zhi-Hua Zhou. Modeling of Geographical Dependencies for Real Estate Ranking, ACM Transactions on Knowledge Discovery from Data (TKDD), 11(1): NO. 11 (2016). Yanjie Fu, Hui Xiong, Xinjiang Lu, Jin Yang, Can Chen Service Usage Classification with Encrypted Internet Traffic in Mobile Messaging Apps, IEEE TRANSACTIONS ON MOBILE COMPUTING (TMC), 15(11): 2851-2864 (2016). Bin Liu, Hui Xiong, Spiros Papadimitriou, Yanjie Fu, Zijun Yao. A General Geographical Probabilistic Factor Model for Point of Interest Recommendation. IEEE Transactions on Knowledge and Data Engineering (TKDE), 27(5): 1167-1179 (2015). Nicholas Jing Yuan, Yu Zheng, Xing Xie, Yingzi Wang, Kai Zheng, Hui Xiong. Discovering Urban Functional ZonesUsing Latent Activity Trajectories. IEEE Transactions on Knowledge and Data Engineering (TKDE), 27(3): 712-725 (2015). Junjie Wu, Hongfu Liu, Hui Xiong, Jie Cao, Jian Chen. K-Means-Based Consensus Clustering: A Unified View. IEEE Transactions on Knowledge and Data Engineering (TKDE), 27(1): 155-169 (2015). Hengshu Zhu, Hui Xiong, Yong Ge, Enhong Chen. Discovery of Ranking Fraud for Mobile Apps. IEEE Transactions on Knowledge and Data Engineering (TKDE), 27(1): 74-87 (2015). Yong Ge, Hui Xiong, Alexander Tuzhilin, and Qi Liu Cost-aware Collaborative Filtering for Travel Tour Recommendations, ACM Transactions on Information Systems (TIS), Volume 32 Issue 1, Article No.4, January 2014. Hengshu Zhu, Chuanren Liu, Yong Ge, Hui Xiong, Enhong Chen Popularity Modeling for Mobile Apps: A Sequential Approach IEEE Transactions on Cybernetics (TC) vol.PP, no.99, pp.1,1 (2014) . Tong Xu, Hengshu Zhu, Enhong Chen, Baoxing Huai, Hui Xiong, Jilei Tian Learning to Annotate via Social Interaction Analytics Knowledge and Information System Journal (KAIS) 41(2): 251-276 (2014). Liyang Tang, Zhiwei Ni, Hui Xiong, Hengshu Zhu Locating Targets Through Mention in Twitter World Wide Web Journal(WWWJ) (2014). Hengshu Zhu, Enhong Chen, Hui Xiong, Huanhuan Cao, Jilei Tian, Ranking User Authority with Relevant Knowledge Categories for Expert Finding, World Wide Web Journal (WWWJ),2013. Jie Cao, Zhiang Wu, Junjie Wu, Hui Xiong, SAIL: Summation-bAsed Incremental Learning for Information-Theoretic Text Clustering, IEEE Transactions on Cybernetics (TC) , Vol. 43, No. 2, pp. 570-584, 2013. Yanchi Liu, Zhongmou Li, Hui Xiong, Xuedong Gao, Junjie Wu, Sen Wu, Understanding and Enhancement of Internal Clustering Validation Measures, IEEE Transactions on Cybernetics (TC), Vol. 43, No. 3, pp. 982-994, 2013. Hongyan Liu, Jun He, Yingqin Gu, Hui Xiong, Xiaoyong Du, Detecting and Tracking Topics and Events from Web Search Logs, ACM Transactions on Information Systems(TOIS), Vol. 30, No. 4, 2012. Byron Gao, Martin Ester, Hui Xiong, Oliver Schulte, Jinyi Cai, The Minimum Consistent Subset Cover Problem: A Minimization View of Data Mining, IEEE Transactions on Knowledge and Data Engineering (TKDE), Vol. 24, No. 2, pp. 309-325, 2012. Zhongmou Li, Hui Xiong, Yanchi Liu, Mining Blackhole and Volcano Patterns in Directed Graphs: A General Approach, Data Mining and Knowledge Discovery Journal (DMKD), pp. 577 - 602, 2012. Junjie Wu, Hui Xiong, Chen Liu, and Jian Chen. A Generalization of Distance Functions for Fuzzy c-Means Clustering, IEEE Transactions on Fuzzy Systems (TFS), Vol. 20, No. 3, pp. 557-571, 2012. Stephen France, Douglas Carroll, Hui Xiong, Distance Metrics for High Dimensional Nearest Neighborhood Recovery: Compression and Normalization, Information Sciences (IS), Vol. 184, Isse. 1, pp. 92-110, February, 2012. Aabhas Paliwal, Basit Shafiq, Jaideep Vaidya, Hui Xiong, and Nabil Adam, Semantics Based Automated Service Discovery, IEEE Transactions on Services Computing (TSC), Vol 5, No 2, pp.246-259, 2012. Junjie Wu, Shiwei Zhu, Hui Xiong, Jian Chen, and Jianming Zhu, Adapting the Right Measures for Pattern Discovery: A Unified View, IEEE Transactions on Systems, Man, and Cybernetics, Part B (TSMCB), Vol. 42, No 4, pp. 1203-1214, 2012. Fuzhen Zhuang, Ping Luo, Zhiyong Shen, Qing He, Yuhong Xiong, Zhongzhi Shi, Hui Xiong, Mining Distinction and Commonality across Multiple Domains using Generative Model for Text Classification, IEEE Transactions on Knowledge and Data Engineering (TKDE), Vol. 24, No. 11, pp. 2025 - 2039, November, 2012. Qi Liu, Enhong Chen, Hui Xiong, Chris H.Q. Ding, Jian Chen, Enhancing Collaborative Filtering by User Interests Expansion via Personalized Ranking, IEEE Transactions on Systems, Man, and Cybernetics - Part B (TSMCB), Volume 42, Number 1, pp. 218-233, February, 2012. Byron J. Gao, Obi L. Griffith, Martin Ester, Hui Xiong, Qiang Zhao, Steven J.M. Jones, On The Deep Order-Preserving Submatrix Problem: A Best-Effort Approach, IEEE Transactions on Knowledge and Data Engineering (TKDE), Volume 24, Number 1, pp. 309-325, January, 2012. Wenjun Zhou, Hui Xiong, Checkpoint Evolution for Volatile Correlation Computing, Machine Learning, Volume 83, Number 1, pp. 103 - 131, 2011. Yong Ge, Hui Xiong, Wenjun Zhou, Siming Li and Ramendra Sahoo, Multi-focal Learning for Customer Problem Analysis, ACM Transaction on Intelligent Systems and Technology (TIST), Volume 2, Issue 3, April 2011. Xiaobin Ma, Chengyang Zhang, Shashi Shekhar, Yan Huang, and Hui Xiong, On Multi-type Reverse Nearest Neighbor Search, Data & Knowledge Engineering (DKE), Volume 70, Number 11, pp. 955-983, November 2011. Enhong Chen, Yanggang Lin, Hui Xiong, Qiming Luo, and Haiping Ma, Exploiting Probabilistic Topic Models to Improve Text Categorization under Class Imbalance, Information Processing and Management, Vol. 47, No. 2, pp. 202-214, March, 2011. Fuzhen Zhuang, Ping Luo, Hui Xiong, Qing He, Yuhong Xiong, Zhongzhi Shi, Exploiting Associations between Word Clusters and Document Classes for Cross-domain Text Categorization, Statistical Analysis and Data Mining, 4(1), pp. 100 - 114, 2011. Shiwei Zhu, Junjie Wu, Hui Xiong, and Guoping Xia, Scaling up Top-K Cosine Similarity Search, Data and Knowledge Engineering (DKE), Volume 70, Number 1, January 2011. Junjie Wu, Hui Xiong, Jian Chen, COG: Local Decomposition for Rare Class Analysis, Data Mining and Knowledge Discovery Journal, Vol. 20, No. 2, pp. 191 - 220, March, 2010. Fuzhen Zhuang, Ping Luo, Hui Xiong, Yuhong Xiong, Qing He, Zhongzhi Shi, Crossdomain Learning From Multiple Sources: A Consensus Regularization Perspective, IEEE Transactions on Knowledge and Data Engineering (TKDE), Volume 22, Number 12, pp. 1664-1678, 2010. Junjie Wu, Hua Yuan, Hui Xiong, Guoqing Chen, Validation of overlapping clustering: A random clustering perspective Information Science, 180 (22), pp. 4353 - 4369, 2010. Cui Yu, Rui Zhang, Yaochun Huang, Hui Xiong, High-dimensional kNN joins with incremental updates, The Geoinformatica, An International Journal on Advances of Computer Science for Geographic Information Systems, Volume 14, Number 1, pp. 55 - 82, January 2010. Xing Jiang, Hui Xiong, Chen Wang, Ah-Hwee Tan, Mining Globally Distributed Frequent Subgraphs in a Single Labeled Graph, Data & Knowledge Engineering, Vol. 68, No. 10, pp. 1034-1058, 2009. Hui Xiong, Junjie Wu, Jian Chen, K-means Clustering Versus Validation Measures: A Data Distribution Perspective, IEEE Transactions on Systems, Man, and Cybernetics --- Part B (TSMCB), Vol. 39, No. 2. (2009), pp. 318-331, 2009. Junjie Wu, Hui Xiong, Jian Chen, Towards Understanding Hierarchical Clustering: A Data Distribution Perspective, Neurocomputing, 72 (10 - 12), pp. 2319 - 2330, 2009. Ping Luo, Hui Xiong, Guoxing Zhan, Junjie Wu, Zhongzhi Shi, Information-Theoretic Distance Measures for Clustering Validation: Generalization and Normalization, IEEE Transactions on Knowledge and Data Engineering (TKDE), Vol. 21, No. 9, pp. 1249 - 1262, September, 2009. Hua Yuan, Guoqing Chen, Junjie Wu, and Hui Xiong, Towards Controlling Virus Propagation in Information Systems with Point-to-Group Information Sharing, Decision Support Systems (DSS), Volume 48, Issue 1, December, 2009. Hui Xiong, Michael Steinbach, Arifin Ruslim, Vipin Kumar, Characterizing Pattern Preserving Clustering, the Knowledge and Information Systems (KAIS) journal, Volume 19, Issue 3, pp. 311-336, June 2009. Junjie Wu, Jian Chen, Hui Xiong, Ming Xie, External validation measures for K-means clustering: A data distribution perspective, Expert Syst. Appl, Volume 36, Issue 3, pp. 6050-6061, 2009. Dihua Guo, Hui Xiong, Vijay Atluri, Nabil Adam, Object Discovery in High-Resolution Remote Sensing Imagery: A Semantic Perspective, the Knowledge and Information Systems (KAIS) journal, Volume 19, Issue 2, pp. 211 - 233, May 2009. Hui Xiong, Wenjun Zhou, Mark Brodie, Sheng Ma, TOP-K φ Correlation Computation, INFORMS Journal on Computing (JOC), Vol. 20, No. 4, pp. 539-552, 2008. Tianming Hu, Sam Y. Sung, Hui Xiong, Qian Fu, Discovery of Maximum Length Frequent Itemsets, Information Sciences, Vol. 178, Issue 1, pp. 69 - 87, January 2008. Tianming Hu, Chew Lim Tan, Yong Tang, Sam Yuan Sung, Hui Xiong, Chao Qu, Coclustering Bipartite with Pattern Preservation for Topic Extraction, International Journal on Artificial Intelligence Tools (IJAIT), 17(1), pp. 87-107, 2008. Tieyun Qian, Hui Xiong, Yuanzhen Wang, Enhong Chen, On the Strength of Hyperclique Patterns for Text Categorization, Information Sciences, Vol. 177, Issue 19, pp. 4040-4058, 2007. Yaochun Huang, Hui Xiong, Weili Wu, Ping Deng, Zhongnan Zhang, Mining Maximal Hyperclique Pattern: A Hybrid Search Strategy, Information Sciences, Vol. 177, Issue 3, pp. 703 - 721, February, 2007. Hui Xiong, Michael Steinbach, and Vipin Kumar, Privacy Leakage in Multi-relational Databases: A Semi-supervised Learning Perspective, VLDB Journal Special Issue on Privacy Preserving Data Management, Vol. 15, No. 4, pp. 388-402, November, 2006. Hui Xiong, Shashi Shekhar, Pang-Ning Tan, and Vipin Kumar, TAPER: A Two-Step Approach for All-strong-pairs Correlation Query in Large Databases, IEEE Transactions on Knowledge and Data Engineering (TKDE), Vol. 18, No. 4, pp. 493-508, April 2006. Chris Ding, Xiaofeng He, Hui Xiong, H. Peng, and Steve, R. Holbrook, Transitive closure and metric inequality of weighted graphs: detecting protein interaction modules using cliques, International Journal Data Mining and Bioinformatics, Vol. 1, No. 2, pp. 162 - 177, 2006. Hui Xiong, Pang-Ning Tan, and Vipin Kumar, Hyperclique Pattern Discovery, Data Mining and Knowledge Discovery Journal, Vol. 13, No. 2, pp. 219-242, September 2006. Hui Xiong, Gaurav Pandey, Michael Steinbach, Vipin Kumar, Enhancing Data Analysis with Noise Removal, IEEE Transactions on Knowledge and Data Engineering (TKDE), Vol. 18, No. 3, pp. 304-319, March 2006. Yao Liu, Sam Y. Sung, Hui Xiong, A Cubic-Wise Balance Approach for Privacy Preservation in Data Cubes, Information Sciences, Vol. 176, Issue 9, pp. 1215-1240, May 2006. Yan Huang, Jian Pei, and Hui Xiong, Mining Co-location Patterns in Spatial Data Sets with Rare Events, the GeoInformatica, An International Journal on Advances of Computer Science for Geographic Information Systems, Vol. 10, Issue 3, pp. 239 - 260, September, 2006. Sam Y. Sung, Yao Liu, Hui Xiong, Peter Ng, Privacy Preservation for Data Cubes, Knowledge and Information Systems - An International Journal (KAIS), Vol. 9, No 1, pp. 38 - 61, January 2006. Jieping Ye, Qi Li, Hui Xiong, Haesun Park, Ravi Janardan, Vipin Kumar, IDR/QR: An Incremental Dimension Reduction Algorithm via QR Decomposition, IEEE Transactions on Knowledge and Data Engineering (TKDE), Vol. 17, No. 9, pp. 1208-1222, September 2005. Yan Huang, Shashi Shekhar, and Hui Xiong (Corresponding Author), Discovering Co-location Patterns from Spatial Datasets: A General Approach, IEEE Transactions on Knowledge and Data Engineering (TKDE), Vol. 16, No. 12, pp. 1472-1485, December 2004. Le Zhang, Hengshu Zhu, Tong Xu, Chen Zhu, Chuan Qin, Hui Xiong, and Enhong Chen. Large-Scale Talent Flow Forecast with Dynamic Latent Factor Model. In Proceedings of the 26th World Wide Web Conference (WWW 2019), 2019. LChengfeng Xu, Pengpeng Zhao, Yanchi Liu, Jiajie Xu, Victor Sheng, Zhiming Cui, Xiaofang Zhou, and Hui Xiong. Recurrent Convolutional Neural Network for Sequential Recommendation. In Proceedings of the 26th World Wide Web Conference (WWW 2019), 2019. Chuan Qin, Hengshu Zhu, Tong Xu, Chen Zhu, Liang Jiang, Enhong Chen, and Hui Xiong. Enhancing Person-Job Fit for Talent Recruitment: An Ability-aware Neural Network Approach. The 41st International ACM SIGIR Conference on Research and Development in Information Retrieval (SIGIR-2018), Ann Arbor, MI, USA, 2018. Huang Xu, Zhiwen Yu, Bin Guo, Mingfei Teng, and Hui Xiong. Extracting Job Title Hierarchy from Career Trajectories: A Bayesian Perspective. In Proceedings of the 27th International Joint Conference on Artificial Intelligence (IJCAI'18). Stockholm, Sweden, July 13-19, 2018. Zijun Yao, Yanjie Fu, Bin Liu, Wangsu Hu, and Hui Xiong. Representing Urban Functions through Zone Embedding with Human Mobility Patterns. In Proceedings of the 27th International Joint Conference on Artificial Intelligence (IJCAI'18). Stockholm, Sweden, July 13-19, 2018. Xiao Zhang, Wenzhong Li, Vu Nguyen, Fuzhen Zhuang, Hui Xiong, and Sanglu Lu. Label-Sensitive Task Grouping by Bayesian Nonparametric Approach for Multi-Task Multi-Label Learning. In Proceedings of the 27th International Joint Conference on Artificial Intelligence (IJCAI'18). Stockholm, Sweden, July 13-19, 2018. Dazhong Shen, Hengshu Zhu, Chen Zhu, Tong Xu, Chao Ma, and Hui Xiong. A Joint Learning Approach to Intelligent Job Interview Assessment. In Proceedings of the 27th International Joint Conference on Artificial Intelligence (IJCAI'18). Stockholm, Sweden, July 13-19, 2018. Haochao Ying, Fuzhen Zhuang, Fuzheng Zhang, Yanchi Liu, Guandong Xu, Xing Xie, Hui Xiong, and Jian Wu. Sequential Recommender System based on Hierarchical Attention Networks. In Proceedings of the 27th International Joint Conference on Artificial Intelligence (IJCAI'18). Stockholm, Sweden, July 13-19, 2018. Tong Xu, Hengshu Zhu, Chen Zhu, Pan Li, and Hui Xiong. Measuring the Popularity of Job Skills in Recruitment Market: A Multi-Criteria Approach. In Proceedings of the Thirty-Second AAAI Conference on Artificial Intelligence (AAAI'18), New Orleans, LA, USA, 2018. Zijun Yao, Yifan Sun, Weicong Ding, Nikhil Rao, and Hui Xiong. Dynamic Word Embeddings for Evolving Semantic Discovery. In Proceedings of 11th ACM International Conference on Web Search and Data Mining (WSDM'18), 2018. Kai Zhang, Chuanren Liu, Jie Zhang, Hui Xiong, Eric Xing and Jieping Ye. Finding Structures of Large Matrices Through Compression. The 23rd ACM SIGKDD International Conference on Knowledge Discovery and Data Mining (KDD-2017), Halifax, Nova Scotia, Canada, 2017. Hao Wang, Yanmei Fu, Qinyong Wang, Changying Du, Hongzhi Yin and Hui Xiong. A Location-Sentiment-Aware Recommender System for Both Home-Town and Out-of-Town Mobile Users. The 23rd ACM SIGKDD International Conference on Knowledge Discovery and Data Mining (KDD-2017), Halifax, Nova Scotia, Canada, 2017. Junming Liu, Leilei Sun, Qiao Li, Jingci Ming, Yanchi Liu and Hui Xiong. Functional Zone Based Hierarchical Demand Prediction For Bike System Expansion. The 23rd ACM SIGKDD International Conference on Knowledge Discovery and Data Mining (KDD-2017), Halifax, Nova Scotia, Canada, 2017. Junming Liu, Yanjie Fu, Jingci Ming, Yong Ren, Leilei Sun and Hui Xiong. Effective and Real-time In-App Activity Analysis in Encrypted Internet Traffic Streams. The 23rd ACM SIGKDD International Conference on Knowledge Discovery and Data Mining (KDD-2017), Halifax, Nova Scotia, Canada, 2017. Yanchi Liu, Chuanren Liu, Xinjiang Lu, Mingfei Teng, Hengshu Zhu, Hui Xiong. Point of Interest Demand Modeling with Human Mobility Patterns. The 23rd ACM SIGKDD International Conference on Knowledge Discovery and Data Mining (KDD-2017), Halifax, Nova Scotia, Canada, 2017. Sen Yang, Xin Dong, Leilei Sun, Yichen Zhou, Richard A. Farneth, Hui Xiong, Randall S. Burd, Ivan Marsic. A Data-driven Process Recommender Framework. The 23rd ACM SIGKDD International Conference on Knowledge Discovery and Data Mining (KDD-2017), Halifax, Nova Scotia, Canada, 2017. Yanjie Fu, Charu Aggarwal, Srinivasan Parthasarathy, Deepak S. Turaga, and Hui Xiong. REMIX: Automated Exploration for Interactive Outlier Detection. The 23rd ACM SIGKDD International Conference on Knowledge Discovery and Data Mining (KDD-2017), Halifax, Nova Scotia, Canada, 2017. Huayu Li, Yong Ge, Hengshu Zhu, Hui Xiong and Hongke Zhao. Prospecting the Career Development of Talents: A Survival Analysis Perspective. The 23rd ACM SIGKDD International Conference on Knowledge Discovery and Data Mining (KDD-2017), Halifax, Nova Scotia, Canada, 2017. Pengpeng Zhao, Xiefeng Xu, Yanchi Liu, Victor S.Sheng, Kai Zheng, and Hui Xiong. Photo2Trip: Exploiting Visual Contents in Geo-tagged Photos for Personalized Tour Recommendation. In Proceedings of 25th ACM International Conference on Multimedia (ACM MM’17), Mountain View, CA, USA, 2017. Pengpeng Zhao, Xiefeng Xu, Yanchi Liu, Ziting Zhou, Kai Zheng, Victor S. Sheng, and Hui Xiong. Exploiting Hierarchical Structures for POI Recommendation. In Proceedings of the 16th IEEE Conference on Data Mining (ICDM’17), New Orleans, LA, USA, 2017. Peizhe Cheng, Shuaiqiang Wang, Jun Ma, Jiankai Sun and Hui Xiong. Learning to Recommend Accurate and Diverse Items. In Proceedings of the 26th World Wide Web Conference (WWW-17), 2016. Hao Lin, Hengshu Zhu, Yuan Zuo, Chen Zhu, Junjie Wu and Hui Xiong. Collaborative Company Profiling: Insights from an Employee’s Perspective. In Proceedings of the Thirty-First AAAI Conference on Artificial Intelligence (AAAI-17), 2017. J Yang, C Liu, M Teng, M Liao, and Hui Xiong. Buyer targeting optimization: A unified customer segmentation perspective. In Proceedings of the IEEE International Conference on Big Data 2016, 2016. Xinjiang Lu, Zhiwen Yu, Leilei Sun, Chuanren Liu, Hui Xiong and Chu Guan. Characterizing the life cycle of point of interests using human mobility patterns. In Proceedings of the 2016 ACM International Joint Conference on Pervasive and Ubiquitous Computing (UbiComp 2016), 2016. Zijun Yao, Yanjie Fu, Bin Liu, Yanchi Liu, and Hui Xiong. POI Recommendation: A Temporal Matching between POI Popularity and User Regularity. In Proceedings of the 16th IEEE Conference on Data Mining (ICDM 2016), 2016. Yanjie Fu, Junming Liu, Xiaolin Li, Xinjiang Lu, Jingci Ming, Hui Xiong and Chu Guan. Service Usage Analysis in Mobile Messaging Apps: A Multi-Label Multi-View Perspective. In Proceedings of the 16th IEEE Conference on Data Mining (ICDM 2016), 2016. Hao Zhong, Chuanren Liu, Xinjiang Lu and Hui Xiong. TO BE OR NOT TO BE FRIENDS: Exploiting Prominent Social Ties for Startup Investment. In Proceedings of the 16th IEEE Conference on Data Mining (ICDM 2016), 2016. Tong Xu, Hengshu Zhu, Xiangyu Zhao, Qi Liu, Hao Zhong, Enhong Chen, Hui Xiong. Taxi Driving Behavior Analysis in Latent Vehicle-to-Vehicle Networks: A Social Influence Perspective. The 22nd ACM SIGKDD International Conference on Knowledge Discovery and Data Mining (KDD-2016), San Francisco, CA, USA, 2016. Huang Xu, Jingyuan Yang, Zhiwen Yu, Hui Xiong, Hengshu Zhu. Talent Circle Detection in Job Transition Networks. The 22nd ACM SIGKDD International Conference on Knowledge Discovery and Data Mining (KDD-2016), San Francisco, CA, USA, 2016..
Chen Zhu, Hengshu Zhu, Hui Xiong, Pengliang Ding, Fang Xie. Trend Analysis of Recruitment Market with Sequential Latent Variable Model. The 22nd ACM SIGKDD International Conference on Knowledge Discovery and Data Mining (KDD-2016), San Francisco, CA, USA, 2016. Leilei Sun, Chuanren Liu, Chonghui Guo, Hui Xiong, Yanming Xie. Data-driven Automatic Treatment Regimen Development and Recommendation. The 22nd ACM SIGKDD International Conference on Knowledge Discovery and Data Mining (KDD-2016), San Francisco, CA, USA, 2016. Bowen Du, Chuanren Liu, Wenjun Zhou, Hui Xiong. Catch Me If You Can: Detecting Pickpocket Suspects from Large-Scale Transit Records. The 22nd ACM SIGKDD International Conference on Knowledge Discovery and Data Mining (KDD-2016), San Francisco, CA, USA, 2016..
Yuan Zuo, Junjie Wu, Has Lin, Hui Xiong. Pseudo-Document-based Topic Modeling of Short Texts without Auxiliary Information. The 22nd ACM SIGKDD International Conference on Knowledge Discovery and Data Mining (KDD-2016), San Francisco, CA, USA, 2016..
Yanchi Liu, Chuanren Liu, Bin Liu,Meng Qu, Hui Xiong. Unified Point-of-Interest Recommendation with Temporal Interval Assessment. The 22nd ACM SIGKDD International Conference on Knowledge Discovery and Data Mining (KDD-2016), San Francisco, CA, USA, 2016. Junming Liu, Leilei Sun, Hui Xiong, Weiwei Chen. Rebalancing Bike Sharing Systems: A Multi-source Data Smart Optimization. The 22nd ACM SIGKDD International Conference on Knowledge Discovery and Data Mining (KDD-2016), San Francisco, CA, USA, 2016. Hengshu Zhu, Hui Xiong, Fangshuang Tang, Qi Liu, Yong Ge, Enhong Chen, Yanjie Fu. Days on Markets: Measuring the Liquidity of Real Estate Markets. The 22nd ACM SIGKDD International Conference on Knowledge Discovery and Data Mining (KDD-2016), San Francisco, CA, USA, 2016. Defu Lian, Yong Ge, Nicholas Yuan, Xing Xie, Hui Xiong. Sparse Bayesian Content-Aware Collaborative Filtering for Implicit Feedback. 25th International Joint Conference on Artificial Intelligence (IJCAI 2016), 2016. Zijun Yao, Yanjie Fu, Bin Liu, Hui Xiong. The Impact of Community Safety on House Ranking. In Proceedings of 2016 SIAM International Conference on Data Mining (SDM 2016), 2016. Qi Liu, Xianyu Zeng, Chuanren Liu, Hengshu Zhu, Enhong Chen, Hui Xiong, Xing Xie. Mining Indecisiveness in Customer Behaviors. In Proceedings of the 15th IEEE Conference on Data Mining (ICDM 2015), 2015. Constantine Alexander Vitt, Hui Xiong. The Impact of Patent Activities on Stock Dynamics in the High-Tech Sector. In Proceedings of the 15th IEEE Conference on Data Mining (ICDM 2015), 2015. Jingyuan Yang, Chuanren Liu, Mingfei Teng, Hui Xiong, March Liao, Vivian Zhu. Exploiting Temporal and Social Factors for B2B Marketing Campaign Recommendations. In Proceedings of the 15th IEEE Conference on Data Mining (ICDM 2015), 2015. Junming Liu, Qiao Li, Meng Qu, Weiwei Chen, Jingyuan Yang, Hui Xiong, Hao Zhong, Yanjie Fu. Station Site Optimization in Bike Sharing Systems. In Proceedings of the 15th IEEE Conference on Data Mining (ICDM 2015), 2015. Huang Xu, Zhiwen Yu, Hui Xiong, Bin Guo, Hengshu Zhu. Learning Career Mobility and Human Activity Patterns for Job Change Analysis. In Proceedings of the 15th IEEE Conference on Data Mining (ICDM 2015), 2015. Fuzhen Zhuang, Dan Luo, Xin Jin, Hui Xiong, Ping Luo, Qing He. Representation Learning via Semi-Supervised Autoencoder for Multi-task Learning. In Proceedings of the 15th IEEE Conference on Data Mining (ICDM 2015), 2015. Chuanren Liu, Fei Wang, Jianying Hu and Hui Xiong. Temporal Phenotyping from Longitudinal Electronic Health Records: A Graph Based Framework. The 21th ACM SIGKDD International Conference on Knowledge Discovery and Data Mining (KDD 2015), 2015. Yanjie Fu, Guannan Liu, Spiros Papadimitriou, Hui Xiong, Yong Ge, Hengshu Zhu, Chen Zhu. Real Estate Ranking via Mixed Land-use Latent Models. The 21th ACM SIGKDD International Conference on Knowledge Discovery and Data Mining (KDD 2015), 2015. Bin Liu, Deguang Kong, Lei Cen, Neil Zhenqiang Gong, Hongxia Jin, and Hui Xiong. Personalized Mobile App Recommendation: Reconciling App Functionality and User Privacy Preference, In Proceedings of the Eighth International Conference on Web Search and Data Mining (WSDM 2015), (Full Paper, 16.4% acceptance), 2015. Hengshu Zhu, Hui Xiong, Yong Ge, Enhong Chen. Mobile App Recommendation with Security and Privacy Awareness. The 20th ACM SIGKDD International Conference on Knowledge Discovery and Data Mining (KDD 2014), 2014. Yanjie Fu, Hui Xiong, Yong Ge, Zijun Yao, Yu Zheng, Zhihua Zhou. Exploiting Geographic Dependencies for Real Estate Appraisal: A Mutual Perspective of Ranking and Clustering. The 20th SIGKDD conference on Knowledge Discovery and Data Mining (KDD 2014), 2014. Meng Qu, Hengshu Zhu, Junming Liu, Guannan Liu, Hui Xiong. A Cost-Effective Recommender System for Taxi Drivers. 2014 ACM SIGKDD International Conference on Knowledge Discovery and Data Mining (KDD 2014), 2014. Chuanren Liu, Kai Zhang, Hui Xiong, Guofei Jiang, Qiang Yang. Temporal Skeletonization on Sequential Data: Patterns, Categorization, and Visualization. The 20th ACM SIGKDD International Conference on Knowledge Discovery and Data Mining (KDD 2014), 2014. Chuanren Liu, Yong Ge, Hui Xiong, Keli Xiao, Wei Geng, Matt Perkins. Proactive Workflow Modeling by Stochastic Processes with Application to Healthcare Operation and Management. The 20th ACM SIGKDD International Conference on Knowledge Discovery and Data Mining (KDD 2014), 2014. Yanjie Fu, Yong Ge, Zijun Yao, Yu Zheng, Yanchi Liu, Hui Xiong. Sparse Real Estate Ranking with Online User Reviews and Offline Moving Behaviors. In Proceedings of the 14th IEEE Conference on Data Mining (ICDM 2014), Shenzhen, China, 2014. Yanchi Liu, Chuanren Liu, Jing Yuan, Lian Duan, Yanjie Fu, Hui Xiong. Exploiting Heterogeneous Human Mobility Patterns for Intelligent Bus Routing. In Proceedings of the 14th IEEE Conference on Data Mining (ICDM 2014), Shenzhen, China, 2014. Bo Jin, Yong Ge, Hengshu Zhu, Guo Li, Hui Xiong, Chao Zhang Technology Prospecting for High Tech Companies through Patent Mining. In Proceedings of the 14th IEEE Conference on Data Mining (ICDM 2014), Shenzhen, China, 2014. Liang Wu, Liang Du, Bo Liu, Guandong Xu, Yong Ge, Yanjie Fu, Yuanchun Zhou, Jianhui Li, Hui Xiong. Heterogeneous Metric Learning with Content-based Regularization for Software Artifact Retrieval. In Proceedings of the 14th IEEE Conference on Data Mining (ICDM 2014), Shenzhen, China, 2014. Guannan Liu, Yanjie Fu, Tong Xu, Hui Xiong, Guoqing Chen. Discovering Temporal Retweeting Patterns for Social Media Marketing Campaigns. In Proceedings of the 14th IEEE Conference on Data Mining (ICDM 2014), Shenzhen, China, 2014. Qi Liu, Zheng Dong, Chuanren Liu, Xing Xie, Enhong Chen, Hui Xiong. Social Marketing Meets Targeted Customers: A Typical User Selection and Coverage Perspective. In Proceedings of the 14th IEEE Conference on Data Mining (ICDM 2014), Shenzhen, China, 2014. Biao Chang, Hengshu Zhu, Yong Ge, Enhong Chen, Hui Xiong, Chang Tan. Predicting the Popularity of Online Serials with Autoregressive Models. In Proceedings of the 23rd ACM International Conference on Information and Knowledge Management (CIKM 2014). to appear. Qi Liu, Biao Xiang, Enhong Chen, Hui Xiong, Fangshuang Tang, Jeffrey Xu Yu. Influence Maximization over Large-Scale Social Networks: A Linear Approach with Bound. In Proceedings of the 23rd ACM International Conference on Information and Knowledge Management (CIKM 2014). to appear. Xin Jin, Fuzhen Zhuang, Hui Xiong, Changying Du, Ping Luo, Qing He Multi-task Multi-view Learning for Heterogeneous Tasks. In Proceedings of the 23rd ACM International Conference on Information and Knowledge Management (CIKM 2014). Yanjie Fu, Bin Liu, Yong Ge, Zijun Yao, Hui Xiong. User Preference Learning With Multiple Information Fusion For Restaurant Recommendation. Proceedings of 2014 SIAM International Conference on Data Mining (SDM 2014), Accepted, 2014. Bin Liu, Yanjie Fu, Zijun Yao, Hui Xiong. Learning Geographical Preferences for Point-of-Interest Recommendation. In Proceedings of 2013 ACM SIGKDD International Conference on Knoweldge Discovery and Data Mining (KDD 2013). to Appear, 2013. Junjie Wu, Hongfu Liu, Hui Xiong. A Theoretic Framework of K-means-based Consensus Clustering. In Proceedings of 23rd Internationa Joint Conference on Artificial Intelligence (JICAI 2013), Oral Presentation, 2013. Biao Xiang, Qi Liu, Enhong Chen, Hui Xiong, Yi Zheng, PageRank with Priori: An Influence Propagation Perspective. In Proceedings of 23rd Internationa Joint Conference on Artificial Intelligence (IJCAI 2013), Oral Presentation, 2013. Hengshu Zhu, Hui Xiong, Yong Ge, Enhong Chen. Ranking Fraud Detection for Mobile Apps: A Holistic View. Proceedings of the 22nd ACM Conference on Information and Knowledge Management (CIKM 2013)) to Appear, 2013. Chuanren Liu, Hui Xiong, Yong Ge, Wei Geng, Matt Perkins. A Stochastic Model for Context-Aware Anomaly Detection in Indoor Location Traces. In Proceedings of the 12th IEEE Conference on Data Mining (ICDM 2012), to appear, 2012. Hengshu Zhu, Kuifei Yu, Huanhuan Cao, Enhong Chen, Hui Xiong, Jilei Tian. Mining Personal Context-Aware Preferences for Mobile Users. In Proceedings of the 12th IEEE Conference on Data Mining (ICDM 2012), to appear, 2012. Chuanren Liu, Tianming Hu, Yong Ge, Hui Xiong. Which Distance Metric is Right: An Evolutionary K-Means View. In Proceedings of the 2012 SIAM International Conference on Data Mining (SDM 2012). pp. 907 - 918, 2012. Xueying Li, Huanhuan Cao, Enhong Chen, Hui Xiong, Jilei Tian. BP-Growth: Searching Strategies for Efficient Behavior Pattern Mining. the 13th IEEE International Conference on Mobile Data Management (MDM 2012). pp. 238 - 247, 2012. Yong Ge, Qi Liu, Hui Xiong, Alexander Tuzhilin, Jian Chen, Cost-aware Travel Tour Recommendation, the 17th ACM SIGKDD International Conference on Knowledge Discovery and Data Mining (KDD 2011), to appear, 2011. Chunyu Luo, Hui Xiong, Wenjun Zhou, Yanhong Guo, Guishi Deng, Enhancing Investment Decision in P2P Lending: An Investor Composition Perspective, the 17th ACM SIGKDD International Conference on Knowledge Discovery and Data Mining (KDD 2011), pp. 292 - 300, 2011. Yong Ge, Hui Xiong, Chuanren Liu, and Zhi-Hua Zhou, A Taxi Driving Fraud Detection System, the 11th IEEE International Conference on Data Mining (ICDM 2011) (ICDM 2011), 181-190, 2011. Qi Liu, Yong Ge, Zhongmou Li, Enhong Chen, Hui Xiong, Personalized Travel Package Recommendation, the 11th IEEE International Conference on Data Mining (ICDM 2011) (ICDM 2011), pp. 407-416, 2011. (ICDM Best Research Paper Award). Yong Ge, Hui Xiong, Alexander Tuzhilin, Qi Liu. Collaborative Filtering with Collective Training, the 5th ACM International Conference on Recommender Systems, pp. 281 - 284, Chicago, US, October, 2011. Hengshu Zhu, Huanhuan Cao, Hui Xiong, Enhong Chen, Jilei Tian, Towards Expert Finding by Leveraging Relevant Categories in Authority Ranking, The 20th ACM Conference on Information and Knowledge Management (CIKM 11), pp. 2221 - 2224, Glasgow, 2011. Yong Ge, Hui Xiong, Alexander Tuzhilin, Keli Xiao, Marco Gruteser,Michael J. Pazzani, An Energy-Efficient Mobile Recommender System , the 16th ACM SIGKDD Int'l Conf. on Knowledge Discovery and Data Mining, (KDD 2010), pp. 899 - 908, 2010. (Accepted for full presentation). Yong Ge, Hui Xiong, Zhi-Hua Zhou, Hasan Ozdemir, Jannite Yu, and K.C. Lee, TOP-EYE: Top-k Evolving Trajectory Outlier Detection, the 19th ACM Conference on Information and Knowledge Management (CIKM 2010), pp 1733-1736, 2010. Zhongmou Li, Hui Xiong , Yanchi Liu, Aoying Zhou, Detecting Blackholes and Volcanoes in Directed Networks, the 10th IEEE International Conference on Data Mining (ICDM 2010), pp. 294 - 303, 2010. Tengfei Bao, Happia Cao, Enhong Chen, Jilei Tian, and Hui Xiong, An Unsupervised Approach to Modeling Personalized Contexts of Mobile Users, the 10th IEEE International Conference on Data Mining (ICDM 2010), pp. 38 - 47, 2010. Yanchi Liu, Zhongmou Li, Hui Xiong, Xuedong Gao, and Junjie Wu, Understanding of Internal Clustering Validation Measures, the 10th IEEE International Conference on Data Mining (ICDM 2010), pp. 911 - 916, 2010. Qi liu, Enhong Chen, Hui Xiong and Chris Ding, Exploiting User Interests for Collaborative Filtering: Interests Expansion via Personalized Ranking, the 19th ACM Conference on Information and Knowledge Management (CIKM 2010), pp. 1697 - 1700, 2010. Fuzhen Zhuang, Ping Luo, Zhiyong Shen, Qing He, Yuhong Xiong, Zhongzhi Shi, Hui Xiong, Collaborative Dual-PLSA: Mining Distinction and Commonality across Multiple Domains for Text Classification, the 19th ACM Conference on Information and Knowledge Management (CIKM 2010), pp. 359-368, 2010. Wenjun Zhou, Hui Xiong, Yong Ge, Jannite Yu, Hasan Ozdemir, and K.C.Lee, Direction Clustering for Characterizing Movement Patterns, the 2010 IEEE International Conference on Information Reuse and Integration (IRI'10), to appear, 2010. Jie Yang, Yong Ge, Hui Xiong, Yingying Chen, and Hongbo Liu, Performing Joint Learning for Passive Intrusion Detection in Pervasive Wireless Environments, the 29th IEEE Conference on Computer Communications, (IEEE INFOCOM 2010), pp. 767-775, 2010. Fuzhen Zhuang, Ping Luo, Hui Xiong, Qing He, Yuhong Xiong, Zhongzhi Shi, Exploiting Associations between Word Clusters and Document Classes for Cross-domain Text Categorization, SIAM International Conf. on Data Mining, (SDM 2010), pp. 13 - 24, 2010. Junjie Wu, Hui Xiong, Jian Chen, Adapting the Right Measures for K-means Clustering, the 15th ACM SIGKDD Int'l Conf. on Knowledge Discovery and Data Mining, (KDD 2009), pp. 877 - 886, 2009. (Accepted for Regular Presentation). Yong Ge, Hui Xiong, Wenjun Zhou, Ramendra Sahoo, Xiaofeng Gao, Weili Wu, Multi-focal Learning and Its Application to Customer Service Support, the 15th ACM SIGKDD Int'l Conf. on Knowledge Discovery and Data Mining, (KDD 2009), pp. 349 - 358, 2009. (Accepted for Regular Presentation). Xiaobin Ma, Shashi Shekhar, Hui Xiong, Multi-Type Nearest Neighbor Queries On Spatial-Temproal Road Networks With Time Window Constraints, ACM-GIS 2009 International Symposium on Advances in Geographic Information Systems, (ACM GIS 2009), pp. 484 - 487, 2009. Huanhuan Cao, Enhong Chen, Jie Yang, Hui Xiong, Enhancing Recommender Systems Under Volatile User Interest Drifts, the 18th ACM Conference on information and Knowledge Management, (CIKM 2009), pp 1257 - 1266,, 2009. Tieyun Qian, Qing Li, Liu Bing, Hui Xiong, Jaideep Srivastava, What's Behind Topic Formation and Development: A Perspective of Community Core Groups, the 18th ACM Conference on information and Knowledge Management, (CIKM 2009), 1843 - 1846, 2009. Wenjun Zhou, Hui Xiong, Volatile Correlation Computation: A Checkpoint View, the 14th ACM SIGKDD Int'l Conf. on Knowledge Discovery and Data Mining, (KDD 2008), pp. 848 - 856. (Best Student Paper Award Runner-Up). Junjie Wu, Hui Xiong, Jian Chen, SAIL: Summation-based Incremental Learning for Information-Theoretic Clustering, the 14th ACM SIGKDD Int'l Conf. on Knowledge Discovery and Data Mining, (KDD 2008), pp. 740 - 748, 2008. Ping Luo, Fuzhen Zhuang, Hui Xiong, Yuhong Xiong, Qing He, Transfer Learning From Multiple Source Domains via Consensus Regularization, ACM 17th Conference on information and Knowledge Management, (ACM CIKM 2008), pp. 103 - 112, 2008. Xiaojun Quan, Enhong Chen, Qiming Luo, Hui Xiong, Adaptive Label-Driven Scaling for Latent Semantic Indexing, In the 31st Annual International ACM SIGIR Conference, (SIGIR 2008), pp. 827-828, 2008. Yi Hong, Sam Kwong, Hui Xiong, Qingsheng Ren, Genetic-Guided Semi-Supervised Clustering Algorithm with Instance-Level Constraints, in Proceedings of the Genetic and Evolutionary Computation Conference, (GECCO 2008), 2008, to appear. Yi Hong, Sam Kwong, Hui Xiong, Qingsheng Ren, Data clustering Using Virtual Population based Incremental Learning Algorithm with Similarity Matrix Encoding Strategy, in Proceedings of the Genetic and Evolutionary Computation Conference, (GECCO 2008), 2008, to appear. Tianming Hu, Hui Xiong, Xueqing Gong, and Sam Yuan Sung, ANEMI: An Adaptive Neighborhood Expectation-Maximization Algorithm with Spatial Augmented Initialization, in Proceedings of the Pacific-Asia Conference on Knowledge Discovery and Data Mining, (PAKDD 2008), pp. 160 - 171, 2008. Junjie Wu, Hui Xiong, Jian Chen, Wenjun Zhou, A Generalization of Proximity Functions for K-means, the 2007 IEEE International Conference on Data Mining, (ICDM 2007), pp. 361 - 370, 2007. Yinglung Liang, Yanyong Zhang, Hui Xiong, Ramendra Sahoo, Failure Prediction in IBM BlueGene/L Event Logs, the 2007 IEEE International Conference on Data Mining, (ICDM 2007), pp. 583 - 588, 2007. Baik Hoh, Marco Gruteser, Hui Xiong, Ansaf Alrabady, Preserving Privacy in GPS Traces via Uncertainty-Aware Path Cloaking, the 14th ACM Conference on Computer and Communication Security, (ACM CCS 2007), pp. 161 - 171, 2007. Ping Luo, Hui Xiong, Kevin Lu, Zhongzhi Shi, Distributed Classification in Peer-to-Peer Networks, the 13th ACM SIGKDD Int'l Conf. on Knowledge Discovery and Data Mining, (KDD 2007), pp. 968 - 976, 2007. Junjie Wu, Hui Xiong, Wu Peng, Jian Chen, Local Decomposition for Rare Class Analysis, the 13th ACM SIGKDD Int'l Conf. on Knowledge Discovery and Data Mining, (KDD 2007), pp. 814 - 823, 2007. Wei Tang, Hui Xiong, Shi Zhong, Jie Wu, Enhancing Semi-Supervised Clustering: A Feature Projection Perspective, the 13th ACM SIGKDD Int'l Conf. on Knowledge Discovery and Data Mining, (KDD 2007), pp. 707 - 716, 2007. Byron Gao, Martin Ester, Jinyi Cai, Oliver Schulte, and Hui Xiong, the Minimum Consistent Subset Cover Problem and its Applications in Data Mining, the 13th ACM SIGKDD Int'l Conf. on Knowledge Discovery and Data Mining, (KDD 2007), pp. 310 - 319, 2007. Tianming Hu, Hui Xiong, Sam Y. Sung, Co-Preserving Patterns in Bipartite Partitioning for Topic Identification, in Proceedings of the Seventh SIAM International Conference on Data Mining, (SDM 2007), pp. 509 - 514, 2007. Michael Steinbach, Pang-Ning Tan, Hui Xiong, and Vipin Kumar, Objective Measures for Association Pattern Analysis, Proceedings of the Joint Summer Research Conference on Machine and Statistical Learning: Prediction and Discovery, AMS Contemporary Mathematics (CONM) book series, 2007. Dihua Guo, Hui Xiong, Vijay Atluri, Nabil Adam, Semantic Feature Selection for Object Discovery in High-Resolution Remote Sensing Imagery, in Proceedings of the Pacific-Asia Conference on Knowledge Discovery and Data Mining, (PAKDD 2007), pp. 71 - 83, 2007. Hui Xiong, Mark Brodie, Sheng Ma, TOP-COP: Mining TOP-K Strongly Correlated Pairs in Large Databases, the 2006 IEEE International Conference on Data Mining, (ICDM 2006), pp. 1162-1166, 2006. Hui Xiong, Junjie Wu, Jian Chen, K-means Clustering versus Validation Measures: A Data Distribution Perspective, the 12th ACM SIGKDD Int'l Conf. on Knowledge Discovery and Data Mining, (KDD 2006), pp. 779-784, 2006. Aabhas Paliwal, Nabil Adam, and Hui Xiong, Web Service Discovery via Semantic Association Ranking and Hyperclique Pattern Discovery, the 2006 IEEE/WIC/ACM International Conference on Web Intelligence, (WI 2006), pp. 649-652, 2006. Xiaobin Ma, Shashi Shekhar, Hui Xiong, Pusheng Zhang, Exploiting Page-Level Upper Bound for Multi-Type Nearest Neighbor Queries, ACM-GIS 2006 International Symposium on Advances in Geographic Information Systems, (ACM GIS 2006), pp. 179-186, 2006. Tieyun Qian, Hui Xiong, Yuanzhen Wang, Enhong Chen, Adapting Association Patterns for Text Categorization: Weakness and enhancements, ACM Conference on information and Knowledge Management, (ACM CIKM 2006), pp. 782-783, 2006. Yaochun Huang, Hui Xiong, Weili Wu, Sam, Y. Sung, Mining Quantitative Maximal Hyperclique Patterns: A Summary of Results, Pacific-Asia Conference on Knowledge Discovery and Data Mining, (PAKDD 2006), pp. 552-556, 2006. Gyorgy Simon, Hui Xiong, Eric Eilertson, and Vipin Kumar, Scan Detection: A Data Mining Approach, SIAM International Conf. on Data Mining, (SDM 2006), pp. 118-129, (Acceptance rate = 16%), 2006. Hui Xiong, Michael Steinbach, and Vipin Kumar, Privacy Leakage in Multi-relational Databases via Pattern based Semi-supervised Learning, in Proc. of the ACM Conference on information and Knowledge Management, (ACM CIKM 2005), pp. 355-356, Bremen, Germany, 2005. Hui Xiong, X. He, Chris Ding, Ya Zhang, Vipin Kumar, Stephen R. Holbrook, Identification of Functional Modules in Protein Complexes via Hyperclique Pattern Discovery, in Proc. of the Pacific Symposium on Biocomputing, (PSB 2005), pp. 221-232, 2005. Yaochun Huang, Hui Xiong, Weili Wu, and Zhongnan Zhang, A Hybrid Approach for Mining Maximal Hyperclique Patterns, in Proc. of the 16th IEEE Int'l Conf. on Tools with Artificial Intelligence (ICTAI), pp. 354-361,2004. Michael Steinbach, Pang-Ning Tan, Hui Xiong, Vipin Kumar, Generalizing the Notion of Support, in Proc. of the Tenth ACM SIGKDD Int'l Conf. on Knowledge Discovery and Data Mining, (KDD 2004), pp. 689 - 694, Seattle, USA, 2004. Jieping Ye, Qi Li, Hui Xiong, Haesun Park, Ravi Janardan, Vipin Kumar, IDR/QR: An Incremental Dimension Reduction Algorithm via QR Decomposition, in Proc. of the Tenth ACM SIGKDD International Conference on Knowledge Discovery and Data Mining, (KDD 2004), pp. 364 - 373, Seattle, USA, 2004 (Acceptance rate = 40/337=12%). Hui Xiong, Shashi Shekhar, Pang-Ning Tan, and Vipin Kumar, Exploiting a Support-based Upper Bound of Pearson's Correlation Coefficient for Efficiently Identifying Strongly Correlated Pairs, in Proc. of the Tenth ACM SIGKDD Int'l Conf. on Knowledge Discovery and Data Mining, (KDD 2004), pp. 334 - 343, Seattle, USA, 2004. (Acceptance Rate=40/337=12%). Hui Xiong, Michael Steinbach, Pang-Ning Tan, and Vipin Kumar, HICAP: Hierarchical Clustering with Pattern Preservation, in Proc. 2004 SIAM International Conf. on Data Mining, (SDM 2004), pp. 279 - 290, Florida, USA, 2004. Hui Xiong, Shashi Shekhar, Yan Huang, Vipin Kumar, X. Ma, J. Yoo, A Framework for Discovering Co-location Patterns in Data Sets with Extended Spatial Objects, in Proc. 2004 SIAM Int'l Conf. on Data Mining, (SDM 2004), pp. 78 - 89, Florida, USA, 2004. Yao Liu, Sam Y. Sung, Hui Xiong, Peter Ng, Data Declustering with Replication, in Proc. of the 9th International Conference on Database Systems for Advanced Applications (DASFAA 2004), pp. 682 - 693, Korea, 2004. Hui Xiong, Pang-Ning Tan, and Vipin Kumar, Mining Strong Affinity Association Patterns in Data Sets with Skewed Support Distribution, In Proc. of the Third IEEE International Conference on Data Mining, (ICDM 2003), pp. 387-394, Melbourne, Florida, USA, 2003. (Acceptance Rate = 58/501 = 12%). (Also in Technical Report TR-03-006 Mining Hyperclique Patterns with Confidence Pruning, January 2003). Jinmei Xu, Hui Xiong, Sam Y. Sung, and Vipin Kumar, A New Clustering Algorithm for Transaction Data Via Caucus, in Proc. 2003 Pacific-Asia Conference on Knowledge Discovery and Data Mining (PAKDD 2003), pp. 551-562, Korea 2003. Yan Huang, Hui Xiong, Shashi Shekhar, and Jian Pei, Mining Confident Co-location Rules without A Support Threshold, in Proc. 2003 ACM Symposium on Applied Computing (ACM SAC 2003), pp. 497-501, Melbourne, FL, March 2003. Hui Xiong, Sam Y. Sung, and S. Huang, Adapting the Right Web Pages to the Right Users, In Proc. of the First SPIE International Conference on Data Mining and Knowledge Discovery, USA, 2000. Baik Hoh, Marco Gruteser, Hui Xiong, Ansaf Alrabady. Enhancing Security and Privacy in Traffic-Monitoring Systems, IEEE Pervasive Computing, Vol. 5, No. 4, pp. 38-46, Oct-Dec, 2006. Xiaojun Quan, Hui Xiong, Wenyu Dou, Liu Wenyin, Yong Ge. Link Graph Analysis for Business Site Selection, IEEE Computer, accepted, 2011. Yinglung Liang, Yanyong Zhang, Hui Xiong, and Ramendra K. Sahoo. An adaptive semantic filter for blue gene/l failure log analysis. In Proceedings of the Workshop on System Management Techniques, Processes and Services (SMTPS) in conjunction with the Twenty-first International Parallel and Distributed Processing Symposium (IPDPS 2007), pages 1 - 8, Long Beach, California, USA, March 26-30, 2007. IEEE. Yong Ge, Chuanren Liu, Hui Xiong, A Taxi Business Intelligence System, the 17th ACM SIGKDD Int'l Conf. on Knowledge Discovery and Data Mining (KDD 2011), to appear,2011.